When members of Congress are frustrated, fed up or things aren’t going their way, they can take to the floor and give a speech. That rarely changes much, because who’s really listening? The tight camera shots on C-SPAN don’t show the mostly empty chamber they’re talking to. But lawmakers fed up with, say, a partial government shutdown have other options, and some are exploring the protest outlets afforded to them. The government shutdown has prompted many lawmakers on both sides of the aisle to take a stand with their paychecks — by delaying or donating the money. Many of the 800,000 federal employees subject to the shutdown missed their first full paycheck Friday. Dozens of members have pledged to donate their pay during the shutdown to charity or have requested that the payments be withheld until the government reopens. Lawmakers earn $174,000 annually — House and Senate leaders earn slightly more — and haven’t voted to give themselves a pay raise in years. However, the 27th Amendment to the Constitution makes holding back pay problematic. It forbids any “change” in members’ pay during a Congress, designed to prevent lawmakers from being able to raise their salaries. But lawmakers can ask the House’s Office of the Chief Administrative Officer to not deliver their paychecks until a deal is reached to open the government. Lawmakers can disrupt legislative action to show their might with two opposite methods, sitting in or walking out. In June 2016, as many as 170 House Democrats staged a sit-in on the chamber floor demanding Republican leaders allow votes on legislation to combat gun violence. The Democrats’ move triggered Republicans to call the chamber into recess, but the protest continued for most of a day and night. “No bill, no break,” the Democrats chanted in the chamber after the House cameras had been flipped off . The cameras, which feed to C-SPAN, are operated by the House recording studio, then under control of the Republican leadership. Lawmakers — in violation of House rules — captured the action with their cellphones and shared pictures and short videos on Twitter, Facebook and Periscope, a live-streaming app. C-SPAN aired many of those videos. Heading in the opposite direction, Democratic members of the Senate Judiciary Committee walked out last September as the panel pushed ahead with a vote on Supreme Court nominee Brett Kavanaugh. When the three Democratic senators — Mazie Hirono, Kamala Harris and Richard Blumenthal — reconvened in the hallway outside, they insisted their walkout wasn’t a stunt. But it certainly made a statement. When sitting in or walking out just won’t do, standing up can also send a message. 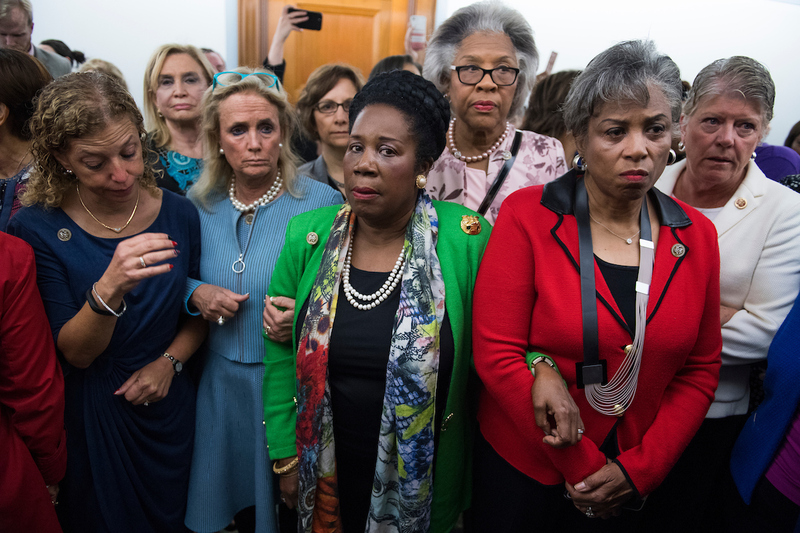 Female House members stood in silent protest during the Senate Judiciary Committee’s September meeting to vote on Kavanaugh. The women silently left the room when approached by Capitol Police. Earlier in the day, the women marched together and gathered on the Capitol steps. Rep. Alexandria Ocasio-Cortez has gained attention for her participation in climate change protests on Capitol Hill, but the New York Democrat is far from the first lawmaker to join protesters in the halls of Congress. In November, after her election but before she was sworn in, Ocasio-Cortez joined close to 200 climate activists to crowd into and around the office of Democratic leader Nancy Pelosi. The group was pushing for an ambitious plan to address climate change. Protesting usually escalates into civil disobedience when handcuffs get involved. Georgia Democratic Rep. John Lewis, an icon of the civil rights movement, was arrested more than 40 times during demonstrations in the 1960s. He’s kept that civil disobedience and tenacity alive as a lawmaker, with five arrests since he was elected to the House in 1986 — twice at Washington’s South African embassy to protest apartheid, twice outside the embassy of Sudan to protest genocide in Darfur, and at an immigration rally in 2013. His most recent arrest came alongside fellow Democrats Keith Ellison of Minnesota, Joseph Crowley of New York, Luis V. Gutiérrez of Illinois, Al Green of Texas, Raúl V. Grijalva of Arizona, and Charles B. Rangel of New York. Last June, Rep. Pramila Jayapal was arrested along with nearly 575 women during a Hill sit-in to protest the Trump administration’s immigration policies. “I’m proud to have been arrested with them, to put myself in the camp of people who believe that the United States of America is better,” Jayapal said in a video posted on Twitter after her arrest. Sometimes, despite their best efforts, members find it hard to get arrested. Ten House Democrats blocked D.C. traffic last year as they joined hundreds of immigration activists to peacefully demonstrate outside the Customs and Border Protection building to protest the Trump administration’s family separation policy at the southern border. They included Gutiérrez, Lewis, Jayapal, Green, Grijalva, Crowley, Judy Chu and Jimmy Gomez of California, Adriano Espaillat of New York and Jan Schakowsky of Illinois. None were arrested. Rep. Bobby L. Rush was booted from the House chamber in 2012 after he donned a hoodie during a speech about racial profiling and the shooting death of Florida teenager Trayvon Martin at the hands of George Zimmerman, a neighborhood watchman. He then replaced his normal glasses with sunglasses as Rep. Gregg Harper, the Mississippi Republican presiding over the chamber, repeatedly banged his gavel, signaling Rush had gone too far and telling him he was in violation of House rules. Rush’s sweatshirt statement held deeper meaning, since the congressman’s own son was shot to death at the age of 29 in Chicago. In another sartorial statement, 65 House Democratic women wore all black at last year’s State of the Union. The move was more than a fashion statement; it was intended to show solidarity with the #MeToo movement and women who have been sexually harassed and abused. In 2017, a group of female Democrats wore all white to President Donald Trump’s first address to a joint session of Congress, an echo of the women’s suffrage movement: Suffragettes frequently dressed in white, one of the movement’s three official colors. Less than a year earlier, Hillary Clinton, the woman Trump defeated for president, wore a white pantsuit when she accepted the Democratic Party’s nomination in Philadelphia.